Charlie was running scared around my street when I left for the soccer game on Sunday. Late at night Charlie was still running. I opened my car door and in he jumped. I can’t believe someone is not looking for him. He is incredibly sweet. 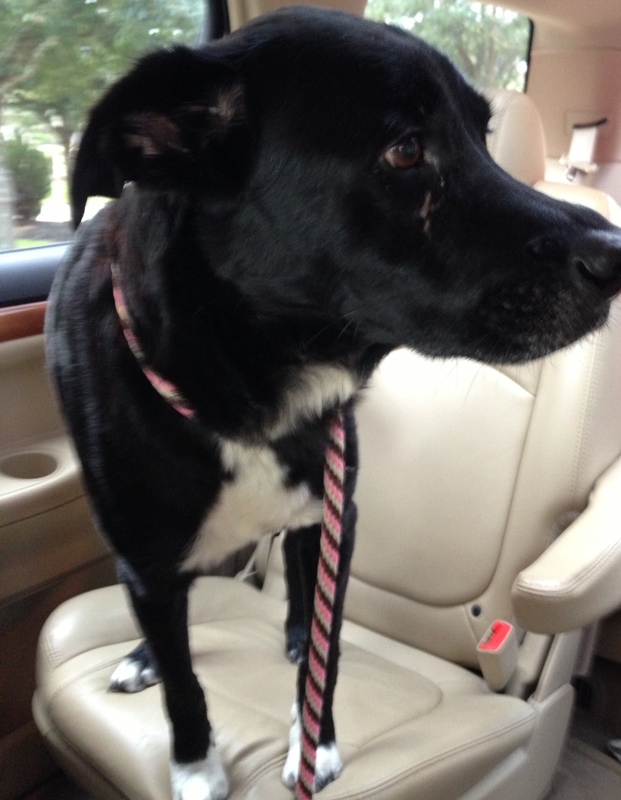 I checked with the local vet (of course, no chip or collar), the City and County Animal Shelters no one is looking). I just don’t understand how people can be so cruel to defenseless animals. Charlie needs a home badly. I already have 3 rescue boxers and the city doesn’t allow any more animals. So sad! Here is my latest project. I am determined to get my scraps under control. 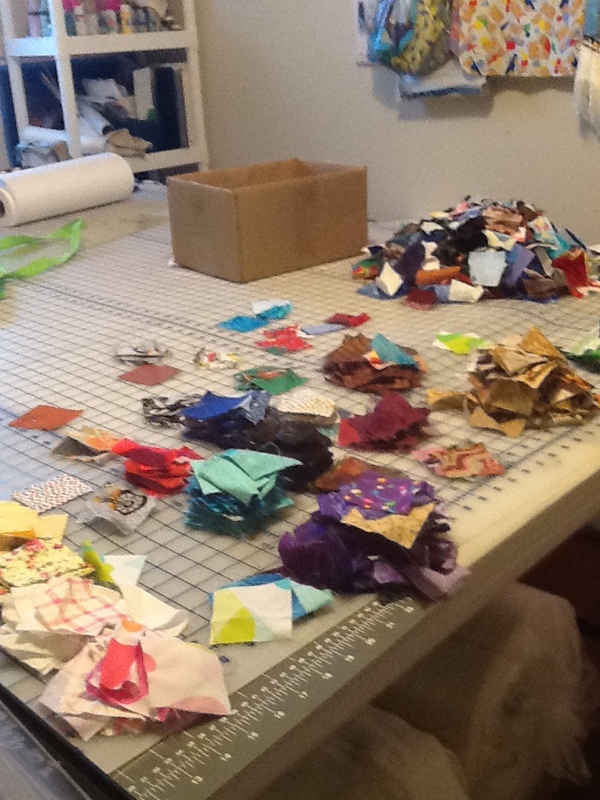 Here I am sorting a box of 2 1/2″ squares into colors – just trying to make sense of them. When I complete that task I will use my Sizzix Die Cutter to work my way thru the two huge baskets of scraps I have accumulated. They are overflowing onto the floor and something has to be done! 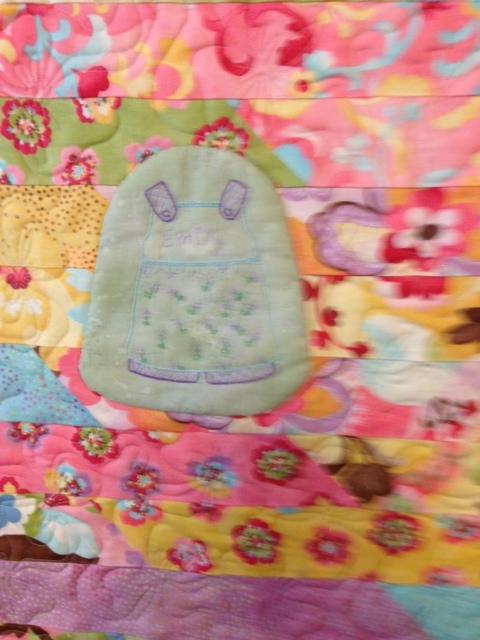 So, what do you do with your finished quilts? Now, I know I have at least this many unfinished tops, but these are complete quilts, draped gently over my upstairs banister. Some of them are working on the second layer now so I really need to find somewhre to put them. There is no more banister space. I’ve been busy all day finishing up costumes. Have one more to go and then, thank heavens, back to quilting! So looking forward to that. Meanwhile, here’s a very neat technique you might try. When you really, really, really want all your points and intersections to match, or when you have fabric that just wants to stretch when you sew it, get out the Elmers glue. Credit for this technique goes to Sharon Schamber. When sewing your seams in a quilt put a very fine line of Elmers School glue (the liquid type-not the stick) down right along side the stitching line, put your two pieces together and press with a hot dry iron. Check everything for accuracy, open seam and re-glue if necessary, then stitch away with your 1/4 seam. Yes, it does take longer to do but you will have an absolutely perfect seam, no distortion anywhere on the fabric. I will certainly use this technique for any show quilts I would make. It will keep those seam lines straight and everything matching! SEW COOL!!!!! You will want to get a fine tip for the glue container. 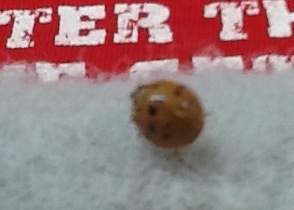 Remember the glue needs to be very fine and solid…not dotted. Boy, I’m almost there. A couple more days of costumes and I can get back to having quilty fun! Still have a couple of technique projects in the mix that I want to show you but I have to get these costumes done first – dress rehearsal on Thursday. I finished 27 pair of dance pants today, blue velvet. Had to take a Claritin just to get thru those. I was able to also manage one more solo costume, pictured here. The baby quilt was a lot of fun to do. 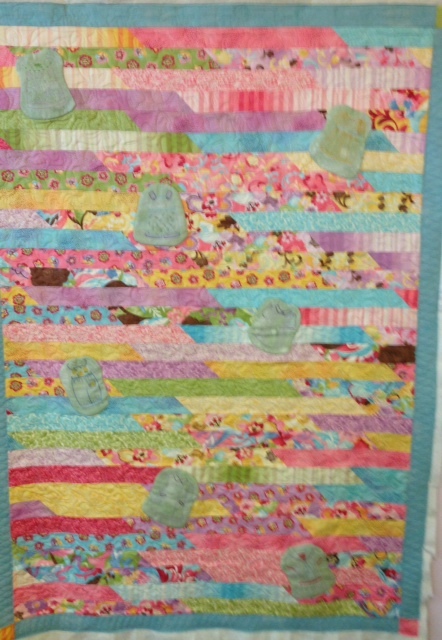 I hope the pictures show you the quilt and the quilting. The back was minky and the front had some darling embroidered clothing on it. 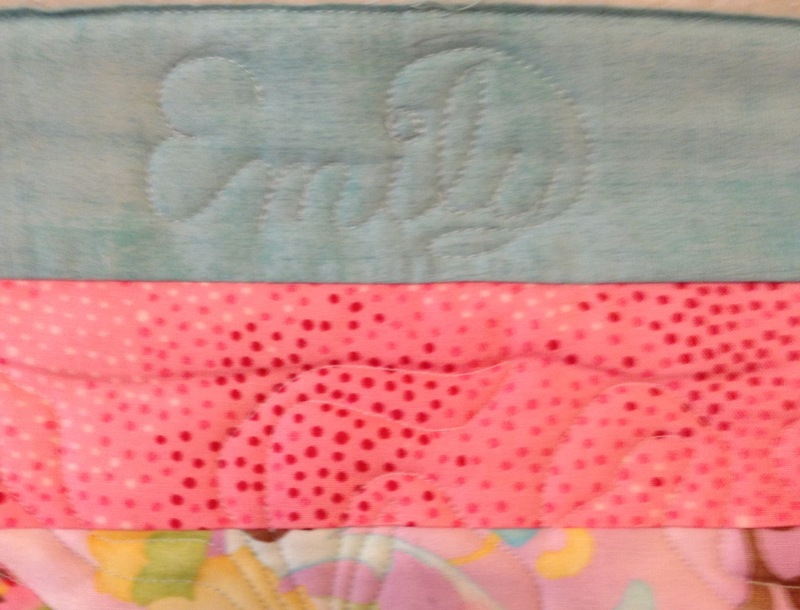 I filled in around the clothing with the cutest bows and put “Emily” accross the top border ribbon quilting down the sides and across the bottom. I think it turned out pretty cute. Will deliver it tomorrow. SUNDAYS ARE SPECIAL! and MY DOG HAS OCD! Well, I finally got Rocky, my oldest Boxer to stay put long enough to get his picture taken. He is the Alpha dog (don’t tell Caitlin) and the oldest of the bunch. Have you ever had a dog with OCD…Rocky is a prime example. He has a dog door leading to a very large back door. When he goes out he must hit the door three times before exiting and another three times before coming back in. He used to do that all of the time but gives himself a break occasionally now. The trash dress project didn’t turn out quite as bad as I thought. Meagan just wanted a base dress made so that she and her girlfriends could attach “trash” to the dresses at the school Girls PJ Choir party. Actually sounds like a pretty neat project! We have enjoyed making them. Most are made out of dance (stretch) fabric so were really easy to put together. Tried to talk her out of the patchwork one, but, as you can see, she won. 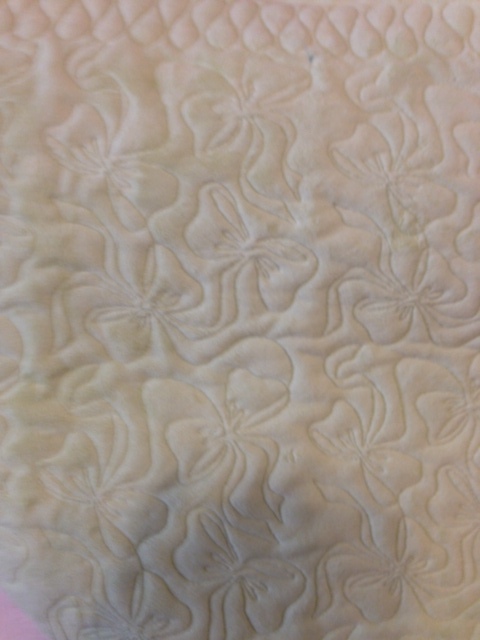 Quilted two king size quilts with an all over design the last couple of days but packed them up without taking pictures…sorry.